Four years ago, in 2013 at the age of 68, Grace Holmes was diagnosed with lung cancer. I first met Grace Holmes at the Macmillan Summer Wellbeing Day in June 2017; organised to support people living with or beyond cancer into activities. Grace had come along to try some of the activity sessions that were on offer that day, with hopes of also meeting new people. I remember meeting Grace; a lively lady, from South Africa, who was enthusiastically taking part in the Keep Fit taster session. It was only after the event that I learnt of Grace’s remarkable story of how her life has been enriched after cancer. “I nearly passed out through shock. I had gone in for some tests and got the results. They said, ‘sit down Mrs Holmes we’ve got some bad news. You have lung cancer.’ The news alone makes you think you’re a goner, you’re finished,” says Grace. 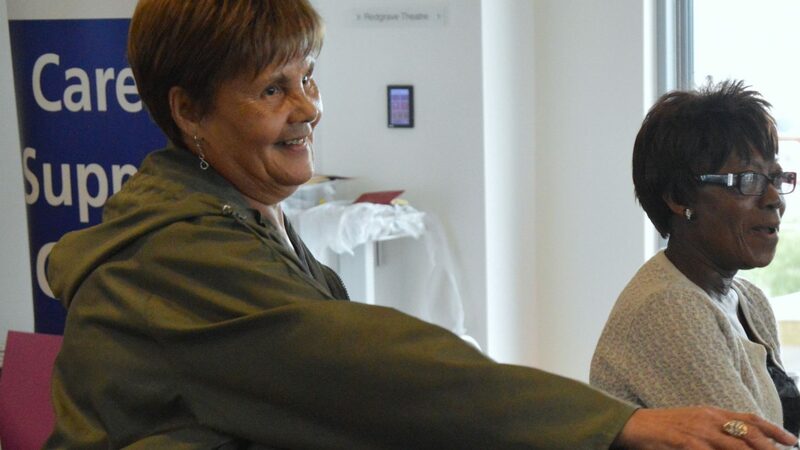 Grace had smoked since the 1960’s.Although she had tried to give up before; it wasn’t until the diagnosis at Southmead hospital, that Grace finally made the decision to give up smoking for good. “It’s so horrendous that news. The funny thing is; I went to the hospital alone. I didn’t expect news like that. Afterwards I got to the bus stop, and you know what I did? I sat down and smoked. I thought what’s the point? I’m done now. I’m done with this world, I’m finished”. “A week later they said they were going to cut [the cancer] out, they said ‘do you agree?’. I said, yes”. In an unexpected twist, the shock of learning of her lung cancer changed Grace’s view of living. Little by little, with the help and support from local initiatives, such as the ACE project and LinkAge partner Bristol Charities, Grace started to engage with other people and activities in her local community. And she didn’t stop there. With the help of LinkAge partner Bristol Charities, Grace led the development of a new Ping Pong group in her local community centre. “I couldn’t believe myself that I suddenly changed from just sitting. And here I am four years after and I’m playing ping pong, and I’m walking, and people would never think I have just one lung. I never miss my ping pong unless I’ve got another appointment. I’m always there”. When asked what her thoughts were on being physically active after living with cancer, Grace responded, “Exercise is the best medicine, and laughter, it’s good for you, it’s good for the heart. You feel more alive, you feel happy. Sometimes when I get up I think, ‘I’ve got to go for a walk, I’m feeling a bit low and depressed’. I walk for about 30 minutes and I come back, and do you know how it makes me feel? It makes me feel like I’ve done something. It feels like I’ve done something big, it makes me so happy, you know, 30 minutes ago I was feeling so sad and now I’m happy again, just by walking”. For now, Grace has her eyes set on trying Badminton and some gentle keep fit exercises, proving there really can be more to life after cancer. If you would like to hear more about activities in your area, or how the Macmillan Prevention & Re-enablement project can support you into activities, please call 0117 353 3042 or email macmillansupport@linkagenetwork.org.uk.